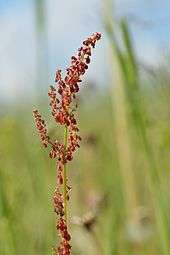 This article is about common sorrel, Rumex acetosa. For other uses, see Sorrel (disambiguation). Not to be confused with Hibiscus sabdariffa, the "sorrel of the Caribbean", used to make a beverage. "Narrow-leaved sorrel" and variants redirect here. These terms may also refer to curled dock (R. crispus). Sorrel is a slender herbaceous perennial plant about 60 centimetres (24 in) high, with roots that run deep into the ground, as well as juicy stems and edible, arrow-shaped (sagittate) leaves. The leaves, when consumed raw, have a sour taste. The lower leaves are 7 to 15 centimetres (2.8 to 5.9 in) in length with long petioles and a membranous ocrea formed of fused, sheathing stipules. The upper ones are sessile, and frequently become crimson. It has whorled spikes of reddish-green flowers, which bloom in early summer, becoming purplish. The species is dioecious, with stamens and pistils on different plants. Common sorrel has been cultivated for centuries. The leaves may be puréed in soups and sauces or added to salads; they have a flavour that is similar to kiwifruit or sour wild strawberries. 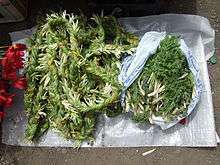 The plant's sharp taste is due to oxalic acid, which is mildly toxic. In northern Nigeria, sorrel is known as yakuwa or sure (pronounced suuray) in Hausa or karassu in Kanuri. It is also used in stews usually in addition to spinach. In some Hausa communities, it is steamed and made into salad using kuli-kuli (traditional roasted peanut cakes with oil extracted), salt, pepper, onion and tomatoes. The recipe varies according to different levels of household income. 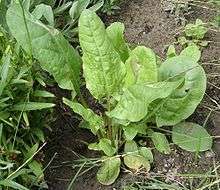 In Romania, wild or garden sorrel, known as măcriş or ştevie, is used to make sour soups, stewed with spinach, added fresh to lettuce and spinach in salads or over open sandwiches. In Russia and Ukraine it is called shchavel (щавель, pronounced [ɕːɐˈvʲelʲ]) and is used to make soup called green borscht. It is used as a soup ingredient in other countries, too (e.g. Lithuania, where it is known as rūgštynė). In Hungary the plant and its leaves are known as sóska (pronounced [ˈʃoːʃkɒ]). It is called kuzukulağı (pronounced [ku.zu.kuˈɫɑ.ɰɯ], 'the lamb's ear') in Turkish. In Polish it is called szczaw (pronounced [ʂʈʂaf]). In Vietnam it is called Rau Chua and is used to added fresh to lettuce and in salads for Bánh Xèo. In Portugal, it is called azeda or azeda-brava (pronounced: [ɐˈzeðɐ], [ɐˈzeðɐ ˈβɾavɐ], "sour", "fierce sour"), and is usually eaten raw in salads or used to make soups. This is identical to its use in Brazil, under the name of azedinha ([ɐzeˈdʒĩɲɐ], "small/lovely tart"). In India, the leaves are called chukkakura in Telugu,and Pundi in Northern Parts of Karnataka(Gulbarga, Bidar, Bijapur etc) in making recipes, such as Chukkakura pappu , a soup made with sorrel and yellow lentils or Pundi Palya , a curry made with sorrel, yellow lentils and peanuts. In Albania it is called lëpjeta, the leaves are simmered and served cold marinated in olive oil, it is used in soups, and even as an ingredient for filling byrek pies (byrek me lakra). ↑ Blamey, M.; Fitter, R.; Fitter, A (2003). Wild flowers of Britain and Ireland: The Complete Guide to the British and Irish Flora. London: A & C Black. p. 64. ISBN 978-1408179505. 1 2 3 Stace, C.A. (2010). New flora of the British isles (Third ed.). Cambridge, U.K.: Cambridge University Press. p. 446. ISBN 9780521707725.